Struggling to get a Halo 5 squad together? Squadvertise! Clever marketing or useful recruiting? Recruitment tool or viral ads? How do you make sure you're playing with the right kind of killing machines? Xbox has just launched the Squadvertiser site to allow you to find the right players to join your elite band of Halo 5 players for multiplayer shenanigans. By creating your wanted ads on the Squadvertiser site Xbox will in turn transform them into billboards, press, social or digital adverts across the world. Your squad could get worldwide attention from millions of rabid Halo gamers. On Sqaudvertiser you can personalise your ads with a range of pre-canned visuals as well as your own text, to try and entice exactly the right kind of person you want to play with. There's a lot of Game of Thrones references out there, plus a lot of folk who are looking for 'serious' players. You can go browse the ads on the site itself and apply to join by contacting the relevant poster via their Gamer Tag in Xbox Live. The latest Halo game - Halo 5: Guardians - was released worldwide a few days back and while the single player game has been increasingly marginalised in favour of the multiplayer it can still be seriously tricky to find folk to play alongside that aren't going to make you want to rip your lungs out in frustration. 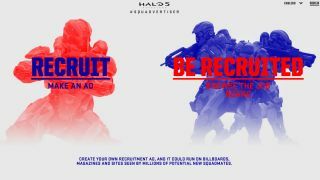 Squadvertiser is an interesting take on squad recruitment, though how much of it is really to make it easier for gamers to find others to join their co-op ranks and how much is just about getting more interesting Halo 5 advertising out there is debatable. Squadvertiser has been created by McCann Erickson (one for you Mad Men fans) so it does feel a lot like crowd-sourced, semi-viral advertising rather than a 'proper' service. Though, who knows, if it's successful Squadvertiser might actually become a thing in its own right and not just for Halo. Halo 5: Guardians - Multiplayer is anything but Spartan.